In the tradition of many Irish teams over the years (but not all) the mixed doubles pairing of John Furey and Louise Kerr have gone down the “no stone left unturned” route as they prepare for the World Championships at Dumfries, April 23-30. 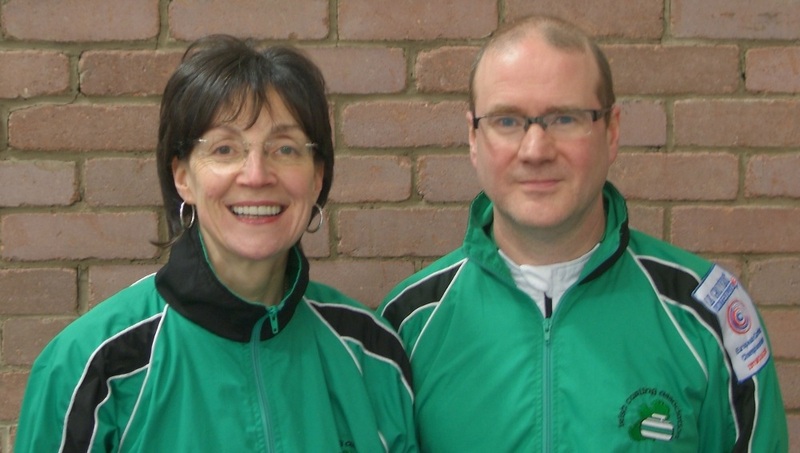 The twosome played their first mixed doubles game since wining the Irish playdowns at the beginning of December when taking on PJ and Anne Wilson in a practice game at Stranraer Ice Rink on Sunday. And…. they got on really well it has to be said. Took shedloads of shots off the bewildered Wilsons. Sitting afterwards having a drink, feeling very pleased with themselves and filled with confidence for the challenge ahead, they read the rules. Turned out they had played the game the wrong way. Having dumped the ‘lose and choose’ format and played the ‘Irish’ version where, if you win the end you both keep last stone in the next end AND get to choose where your placed stone goes. A win-win format! NB – players must read the rules before playing in future. For the few out there who don’t know the story behind the “no stone left unturned” comment, we have to go back to Moscow and the Europeans in 2011. Jane meet Hazel…….. Hazel meet Jane.